This 900 page, four volume set consists of documentation pertinent to 20 of the 111 Tesla patents registered with the U.S. Patent Office. Filed between 1893 and 1909, included are the original applications and amendments, plus related documents. This manuscript was prepared from photocopies and microfilm of the original patent wrappers. A great deal of the typed material from that era does not provide good legibility. Many of the photocopies required some darkening of letters and numbers to be suitable for printing. This was done to preserve the authenticity of the published material. In some cases, it was necessary to retype complete pages from the microfilm for better readability. These volumes represent the largest and most important work pertaining to the inventions and discoveries of Nikola Tesla. Patents issued to Nikola Tesla represent the culmination of his creative efforts and, therefore, must be considered as a basic source of information. However, it has happened that many of the patents, as issued, do not reflect the correct explanation and completeness of detail one would expect. In trying to duplicate Tesla's experiments (the transmission of energy without wires, for example), the serious investigator encounters the lack of detail and explanation of his basic principles. This has been a frequent comment or complaint among those who have tried to duplicate the results which were originally reported. 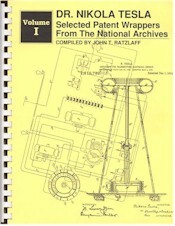 As portions of the subject matter in these volumes involved new technologies, the patent examiners frequently did not understand, and in many instances misinterpreted the original claims. Many of the claims were not allowed, and changes were made to satisfy the patent office examiners' comprehension of the principles involved. This resulted in the issuance of patents which were neither complete nor entirely accurate. In some cases the claims were rejected as they were thought to be inoperative. In quite a few instances Tesla's response consisted of the following preliminary statement: "Cancel the entire specifications and claims, and amendments thereto, except for the signatures and substitute the following:" The revised specifications were then either an effort to explain the original concept in different words, or when there was no recourse, to change and rewrite the application to satisfy the understanding of the patent office. The latter situation resulted in the issuance of patents in which the details were neither clear nor complete. Finally, the scope of some of the final patents has been narrowed, so that many interesting and important applications of the basic idea are not apparent. This publication, therefore, is intended to supplement and clarify the existing patents. It is noted that Tesla made changes in the patent application specifications to reflect new and improved ideas as the result of experimentation. This is particularly evident during and immediately following the 1899 Colorado Springs experiments. (1) Substantially more detail in the principles and construction of mechanical oscillators, bladeless turbines and pumps. (2) Specific reference to velocity of energy over the face of the earth at 1.57 times the speed of light. A comment directed to the Patent Office by the patent attorneys states, "To quote a few intimately associated with the present subject, he (Tesla) had found that, contrary to the theory in vogue, which also seems to be held with the examiner, the velocity of propagation of electricity through conducting media is often far in excess of that given in the text books, as determined by Lord Kelvin, Kohlrausch and other authorities. He has also established that no appreciable energy can be transmitted to any considerable distance by Hertzian or electro magnetic waves, supposed to pass out at right angles to the current path in an oscillating circuit, as is now held." (3) Explanation of standing waves, including methods of varying the period of oscillation for detection of speed and location of moving vessels. (4) Using signals of different wavelength, "stationary" waves can be made to travel slowly over the globe, as though it were perfectly smooth. (5) At frequencies less than 6 cycles per second, energy is not transmitted, as such, but rather the earth acts as a capacity. (6) Separate grounds are used in relation to the stationary wave to obtain a difference in potential. (7) Low temperature research involving flat spiral coils results in increased intensity and duration of oscillations. The contents are of the greatest importance to the understanding of Tesla's inventions and discoveries, some of which were made nearly a century ahead of their time.